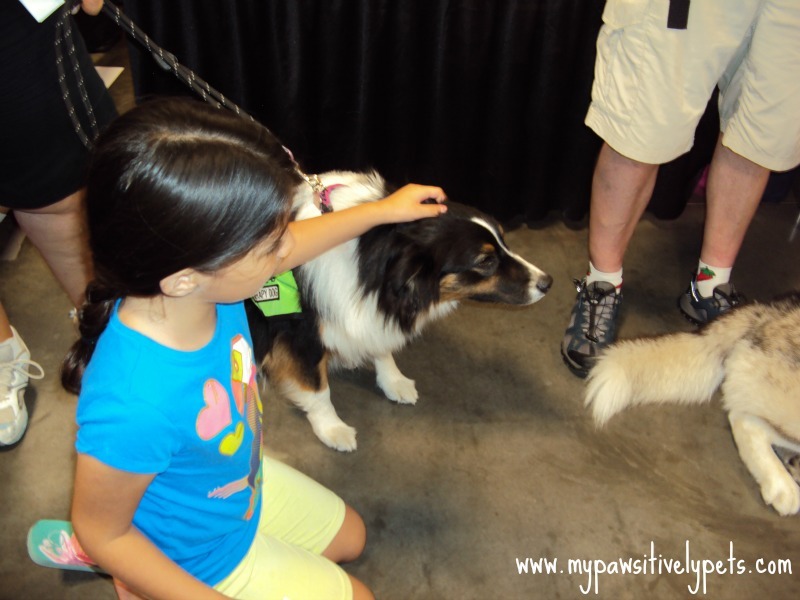 This past weekend on Saturday my two daughters, my mom, and I headed down to the Austin Pet Expo to check things out. 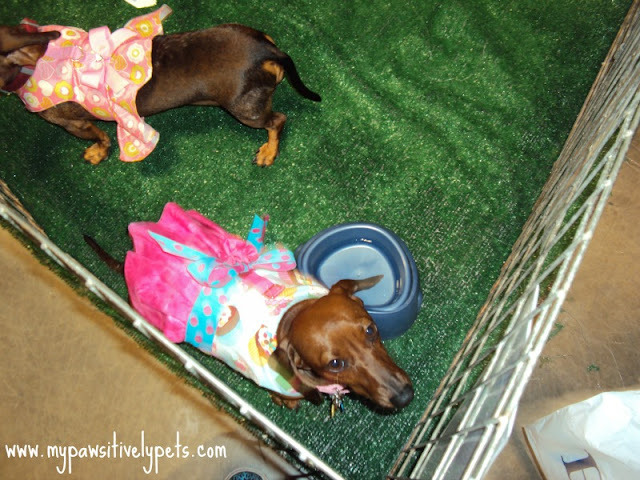 This was the first ever pet expo I had ever attended and it was lots of fun! My kids loved it. Mostly because there were dogs everywhere! 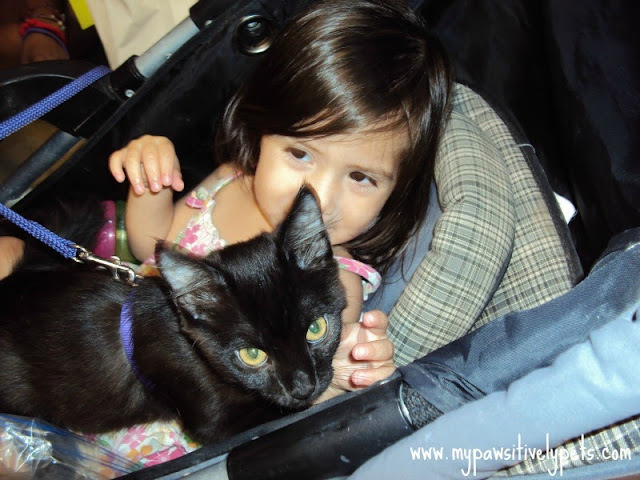 My 18 month old, Violet, loves animals - especially cats. Whenever she sees Honey Delite or a cat on TV she says "nyow". Supposed to be "meow" but pretty close. She also does this when she sees dogs or our pet rat, Nibblet. Surprisingly, she is REALLY good with animals. I'll have to share a video one day of how she handles Nibblet. Anyways, she saw all the doggies and was meowing at them. The dogs seemed to enjoy trying to lick her Cheetoh fingers too. This lady had a cat in her backpack and let her pet it. My mom decided to put it in her stroller. The cat was very nice and so was Violet. Of course, there weren't many cats there. These two gorgeous cats are Blue Moon and Moonshine. They were probably some of the sweetest cats I've ever met. Lily enjoyed petting them. They are actually available for adoption from Austin Siamese Rescue right now. Like I've already said, we saw TONS of dogs. Lily had a fun time giving them all pets and scratches. 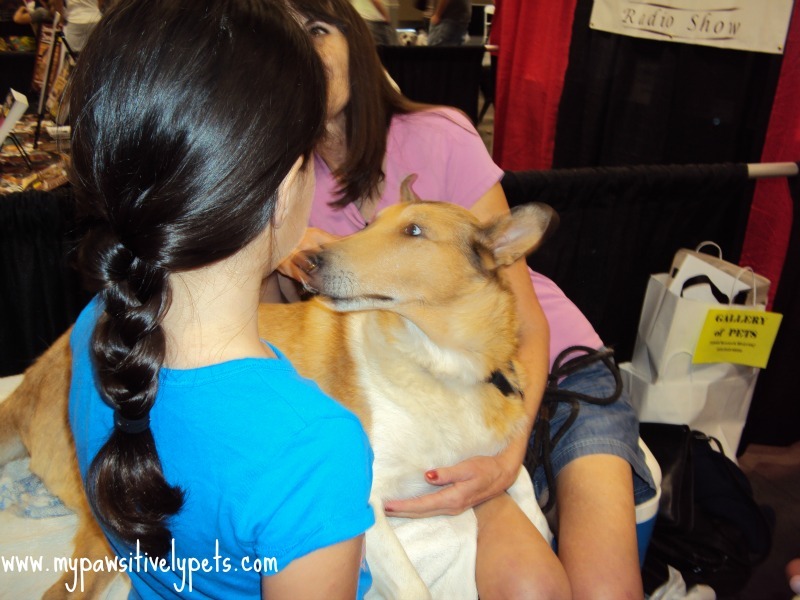 Here she is petting a smooth Collie. Below is T-Bone and Brisket. They were both pretty cool dogs. 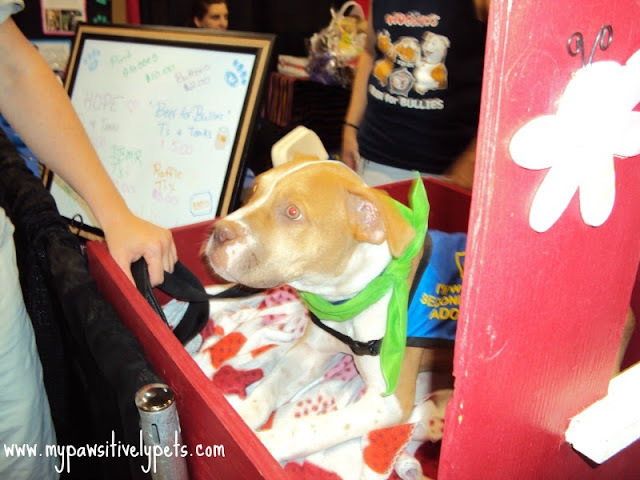 We stopped at this Puppy Kissing Booth to give this cutie pictured below some love. One of my former co-workers who helps with Adopt-a-Bull rescue in Austin is fostering this handsome dude. His name is Smiley. Lily got to pet a therapy dog named Maddie. Lily petting therapy dog Maddie. I wish I knew more about this Dachsund girl, but I don't. She was a sweetheart and was practically jumping into my arms. Recognize that cute little Westie? It's Preston from Preston Speaks! Preston and his mom were very nice and we got to talk to them for a few minutes. 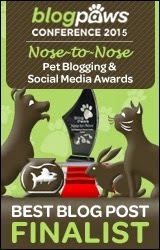 She's the first pet blogger I've had the chance to meet in person, so that was pretty cool. 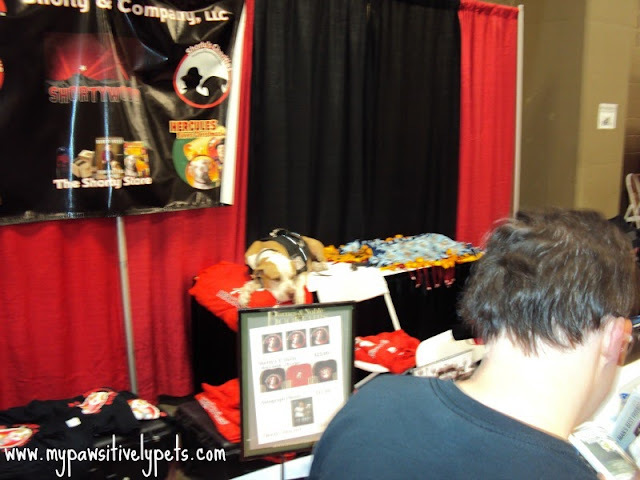 Speaking of famous pups, the Pit Boss - Shorty Rossi - was at the Austin Pet Expo too with his dog Hercules. Hercules is laying on the table behind Shorty who isn't pictured. 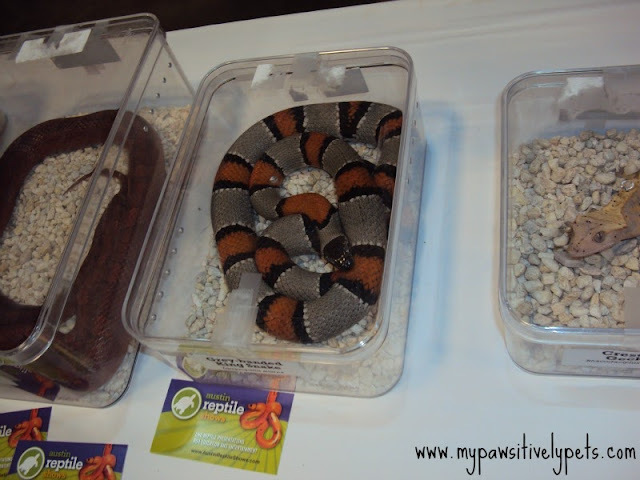 Besides dogs and cats, there was also a couple of reptiles at the expo. And of course, we brought home lots of goodies. My mom was more into getting all the goodies than I was, so I took a picture of her loot. I got some too, but not as much as her. So as you can see, it was a really fun experience and I hope I can attend more events like this in the future! I know it's Wordless Wednesday, but maybe the abundance of cute photos will make up for my abundance of words. The Austin Parrot Society was supposed to be there too but I didn't see them =/ Preston's mom said that this expo was "crazy", and she's been to lots of them. Austin peeps love their pets I guess! That looks like tons of fun, and what a great experience for your daughters! 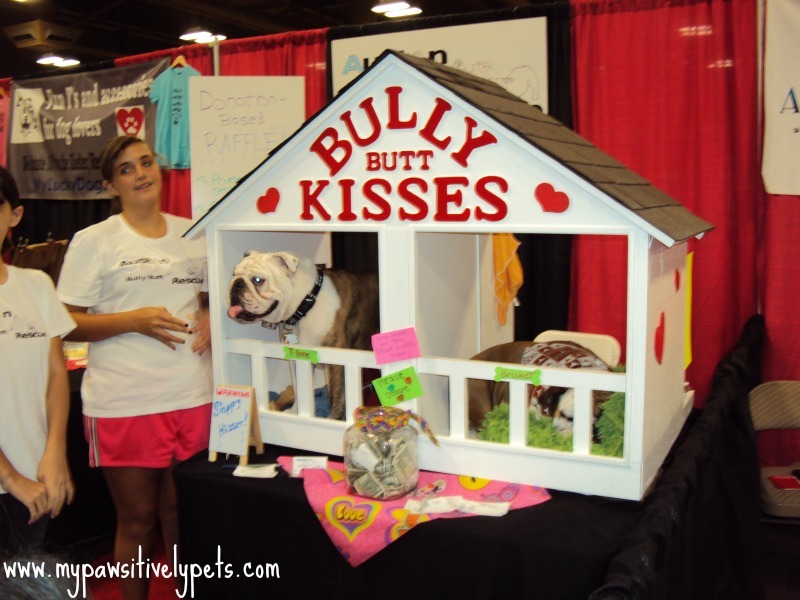 I can't wait to get to a pet expo. I'm also really excited to meet lots of bloggers "in real life!" Thanks for sharing your experience! So cute. Looks like great fun! That looks like a fun time and a fun bunch of critters! Looks so fun! I have never been to pet expo before (I don't know if there's one here). The sulcata looks huge!! 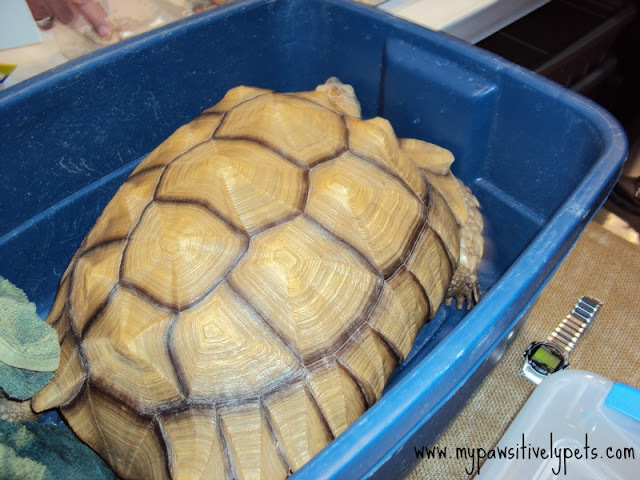 If I have a big yard, I love to adopt one of them and complete my turtle family. That sulcatta was very big. I have seen some bigger ones before but he was still a good size. Wow looks like you had a great day! Oh that looks like it was great fun. What a great thing to do to meet all those animals. Those two cats sure are pretty. Have a great day. So glad to hear you had a great time at the expo too! The one in Nashville had a LOT of cats and dogs too, but also rabbits, guinea pigs, and a miniature horse that was wearing basketball shoes! Granddaughter loved it as well, and the first blogger we've gotten to meet was also Preston! 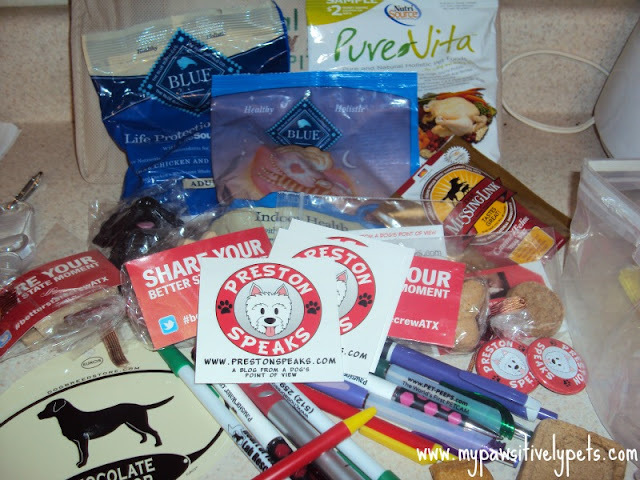 Her favorite thing in her swag-bag was from Preston. Now all I'm hearing half the time is "When I get old enough, I want 'a Preston,'" since there was a WHW rescue at the show. Hopefully, one day, we'll get to meet you as well! That would be awesome! I didn't see any other animals there. We were talking about bringing my rat, but I'm not sure how that would work out lol. My daughter's favorite things in her bag were also from Preston hehe. She says she wants to follow his blog. Preston is a cutie isn't he? 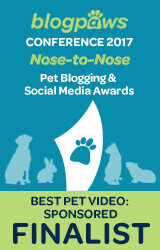 I am gonna see his Mom at BarkWorld...will give her a shout out for you! Oh how fun you're going to BarkWorld! I don't think I knew that yet. Have fun! The kissing booths were lots of fun! Hey Elizabeth - as far as I can tell, no one was selling any animals. 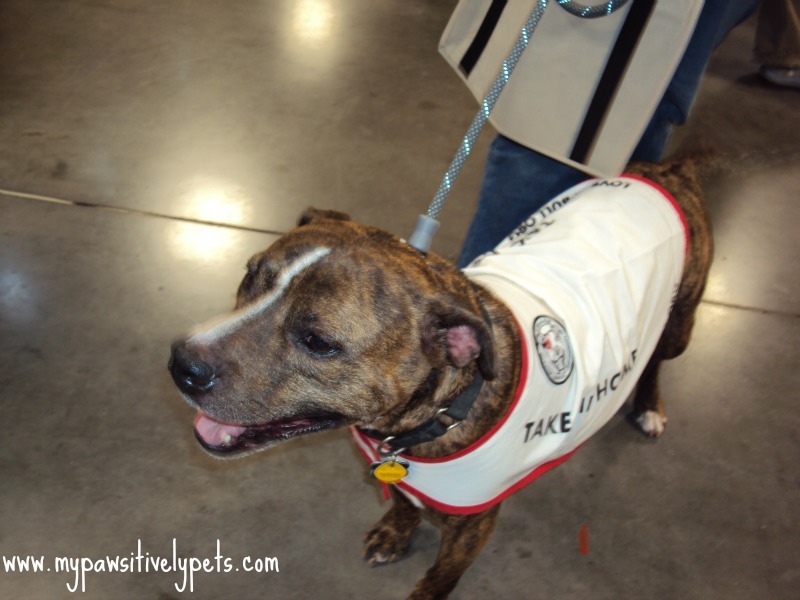 There were tons of rescues and adoptable pets though. Thank dog there were no sugar gliders there. Those things scare me! lol I think I have been scarred for life after handling them at the vet clinic. It looks like it was a lot of fun! We are looking forward to when the expo comes to Virginia in September! Hope you guys have fun there! Those two cats were absolutely gorgeous! Looks like you had an awesome time! Thanks for sharing all the furbaby and unfurred-baby pics! Love em! BTW, your girls are just adorable! That looks like it was so much fun. Did they have many things for cats there? 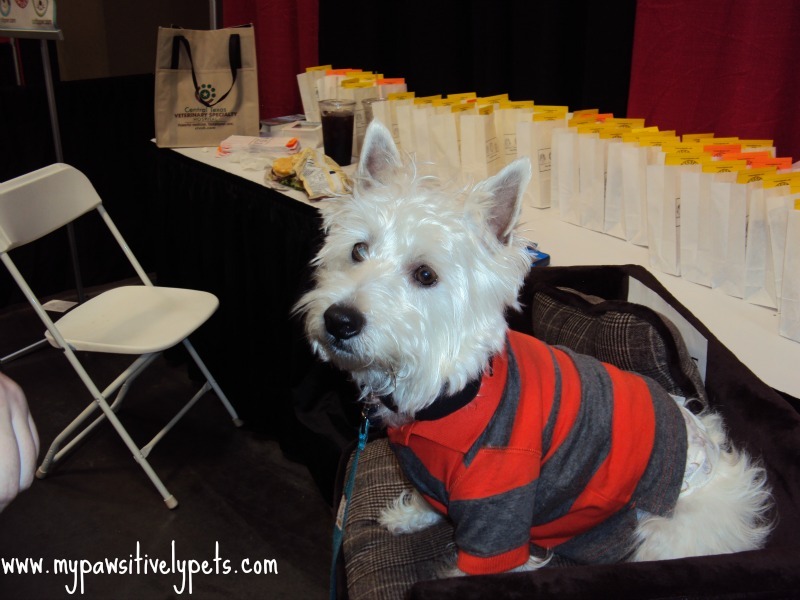 The expo seemed mostly geared towards dogs to me. There were dogs everywhere you stepped. There were a couple of cats for adoption and booths with cat things there though. Not as much as the dog stuff. That Expom looks like it was awesome! We love Preston, Shorty and Hercules. And we REALLY love that Violet is so sweet and gentle with animals! So sweet! Thanks guys! 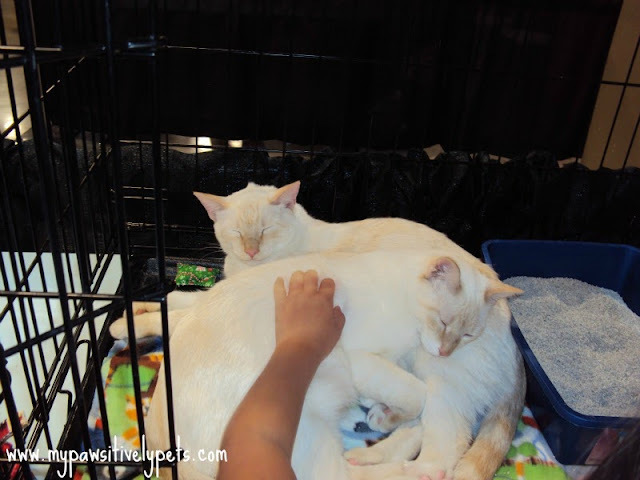 I think it would be super fun to go to a cat expo. I bet my daughters would love that! One of my old co-workers used to go to cat shows. Maybe I should look into it. Oh, that looks like a fun time! I'm so happy for you. :) Your girls are ADORABLE!!! It really was a fun event. I honestly don't think I've ever seen so many dogs and people in one place! I am sorry I missed seeing/meeting ya'll. But do have those business cards of yours ready to place at my booth next year!!! Looks like a great time was had by all! Never saw a turtle that big. I hope the killer turtle my neighbor offered to let me meet isn't that big. They are giant tortoises. I've seen ones bigger than the one in the picture before. I hope killer turtle isn't too huge! Mowzers, looks like you had some FUN! Wishing forever homes for those nice meezers very soon! WOW!!!! That was one fun day indeed...love seeing all the cool pics of the animals and doggies...Your daughter is so beautiful!!!! Hugs and a wonderful end of the week to you dear friend!!!! Thank you guys :) Glad you enjoyed the pics! Aw, looks like you guys had a fabulous time!!! :-D But, what happened to poor Shiner???? 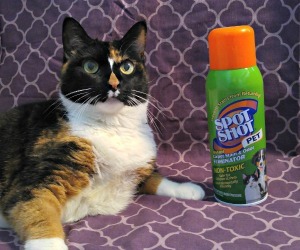 Hehehe, I'm sure she was ecstatic when you came home with the loot!! Hey Goose - Shiner probably wouldn't do well in the situation. I mean, I wouldn't know what to expect. She likes most dogs, but isn't fond of strangers sometimes. Then again, the stranger thing is mostly when it's on her property. Regardless, it's hard to tote around 2 kids and a dog =/ She did enjoy the goodies though! That would be awesome! Or at least maybe a tail? Thankfully, my mom came along and helped me herd the kids around. We go to the Indy Pet Expo each year in November. It's pretty fun.